Texas country, like the mainstream has its share of artists that rely too much on generic songs that lack both substance and individualism. It can be difficult to tell one artist from another in a crowded landscape. Although the sound and lyrics of the songs sound like they belong in the country genre, they can still be their own brand of generic. It is up to the newer generations of artists to break the mold. Texas country singer/songwriter, 20 year old Mason Lively delivers an impressive debut album containing sharp songwriting and a distinct country sound. Making the debut even more impressive is the fact that he wrote every song that appears on the album. Lively is an “old soul” whose songwriting ability is well beyond his years. The lead single “Lonely Comes Back Around” explains why he runs away from love. He was once deeply in love before the woman that he was in love with left him. Now, he goes from woman to woman, leaving relationships before he gets too close and he gets hurt again. Songs like “Hard to Let Go” and “Right Back to You” are two of the more traditional leaning songs on the album. The former is a heart break song with a more dialed back steel guitar played while the ladder has some great fiddle play. Lively describes the toll that touring can take on in artist in the opening song “Heavy Toll.” Fans often forget about what these artists have to go through night in, night out especially independent artists like Lively. The fiddle play in “Early Grave” at times reminds me of something that you would hear on a Turnpike Troubadours song. This love song is another example of Lively demonstrating his ability to write songs with tremendous imagery. After his spouse leaves him he begins smashing and burning things. His self destructive behaviors are going to lead him into an early grave. 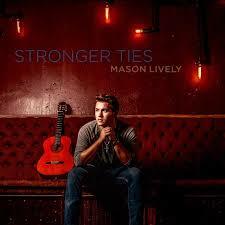 This is an impressive debut album from up and coming country/Americana artist Mason Lively. He shows real promise and sharp songwriting skills at the ripe age of 20.